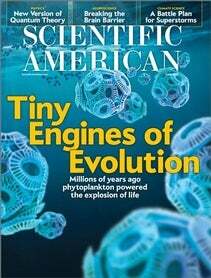 In the June issue of Scientific American, Ronald Martin of the University of Delaware and Antonietta Quigg of Texas A&M University at Galveston explain how increases in the quantity and nutrient content of tiny plants called phytoplankton probably helped power the rise of the modern marine mammals. As so-called green phytoplankton gave way to red phytoplankton, so named for the type of chlorophyll they use during photosynthesis, a host of new sea creatures emerged, starting around 250 million years ago. The slide show below showcases some of the myriad intricate forms of red phytoplankton—a group that includes coccolithophores, dinoflagellates and diatoms—that populate the world’s oceans today.